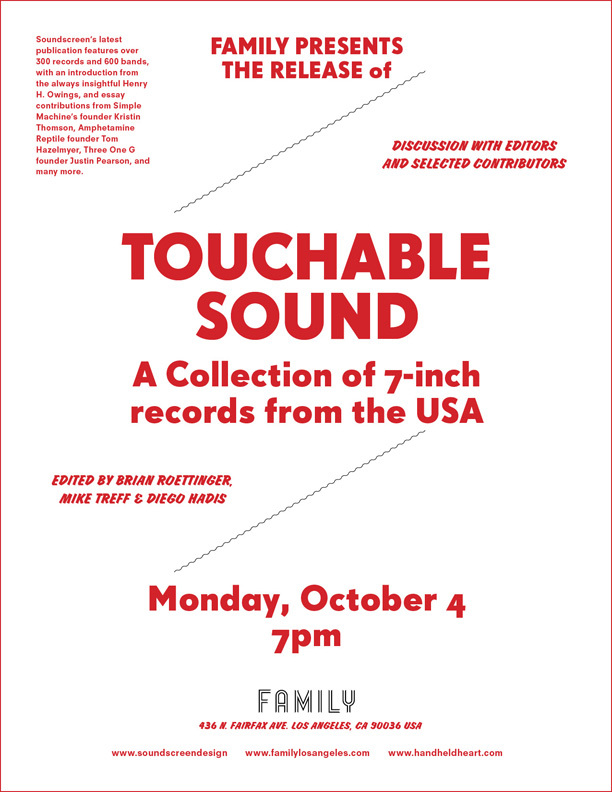 Book launch for Touchable Sound! In an era that advocates streamlined product and music at the click of a mouse, Touchable Sound celebrates those independent-spirited bands and musicians who make their own records, relishing the opportunity to produce labor-intensive one-off artifacts with no prospect of remuneration. As Henry H. Owings puts it in his introduction, it is a book that "honors those that invest countless hours to further their art... It's about having an attention to detail and a disinterest in the bottom line." 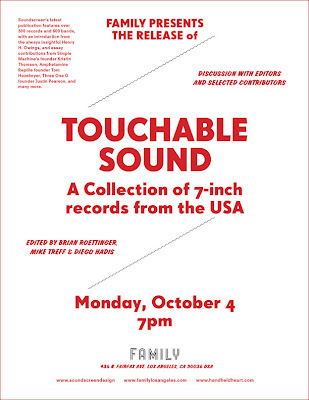 Curated by Brian Roettinger, Michael Treff and Diego Hadis, and organized by region across the U.S., Touchable Sound focuses on rare, labor-intensive, exquisite and unique examples of American seven-inch record design spanning nearly 25 years, lovingly documenting the obscure and the hard-to-find with the help of musicians, artists and designers. Many of these records--by bands such as Olivia Tremor Control, Neutral Milk Hotel, Chromatics, Fast Forward, Nuzzle, Gogogo Airheart, Young Ginns, Men's Recovery Project, Angel Hair, Universal Order--have never previously been seen by a wide audience and were originally pressed in extremely limited runs. Editorial contributors include Henry Owings (Drug Racer Records, Chunklet magazine), Sam McPheeters (Vermiform Records), Tom Hazelmyer (Amphetamine Reptile Records), Kristin Thompson (Simple Machines Records) and more. 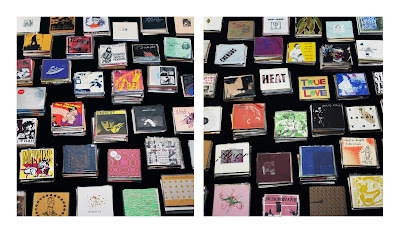 Designed by Brian Roettinger, the book contains photographs of every record documented. 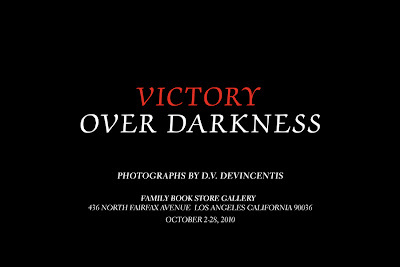 Family Bookstore is proud to present a month long exhibition of photographs by D.V. DeVincentis. From October 2nd to October 28th. D.V. DeVincentis was born in Europe, and raised in Evanston, Illinois. He is an award winning writer and producer, who has written and co-written many films, among them Grosse Pointe Blank and High Fidelity. 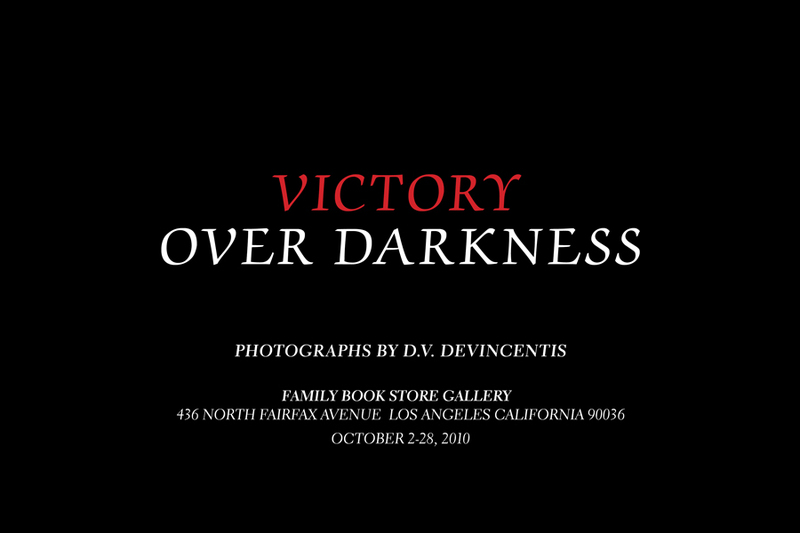 Victory Over Darkness is his first solo exhibition of photographs. He currently lives in Los Angeles. 2009's Prison Pit was an unadulterated smash hit upon its release in 2009, and the balls-to-the-wall series returns with more action and mayhem like only Johnny Ryan can deliver . 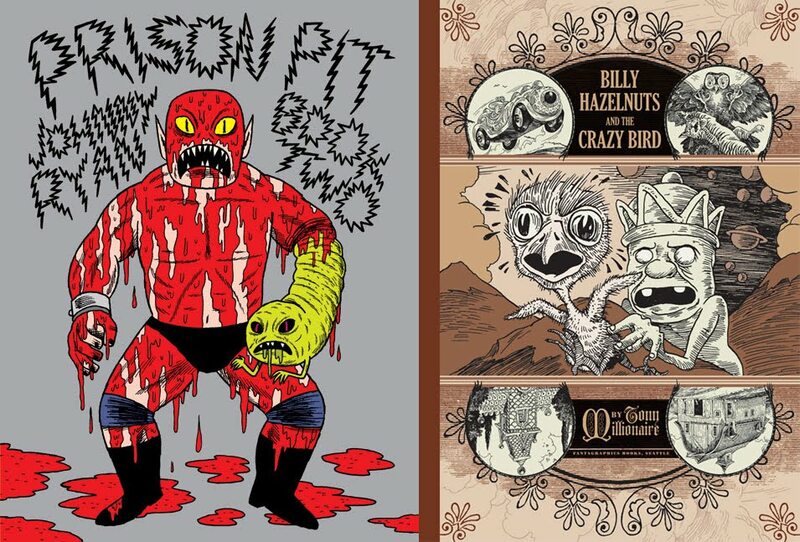 Prison Pit blends Ryan’s fascination with WWE wrestling, grindhouse cinema, first person action video games, Gary Panter’s “Jimbo” comics, and Kentaro Miura’s “Berserk” Manga into a brutal and often hilarious showcase of violence like no other comic book ever created. 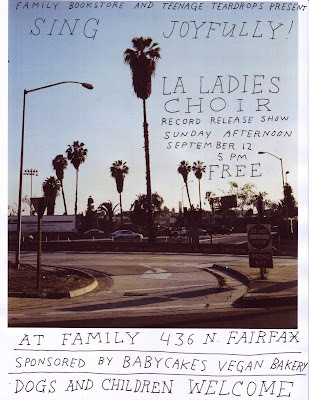 Family and Teenage Teardrops are proud to present the release of 'Sing Joyfully' - the debut EP by the LA Ladies Choir. With a live LA Ladies Choir performance. 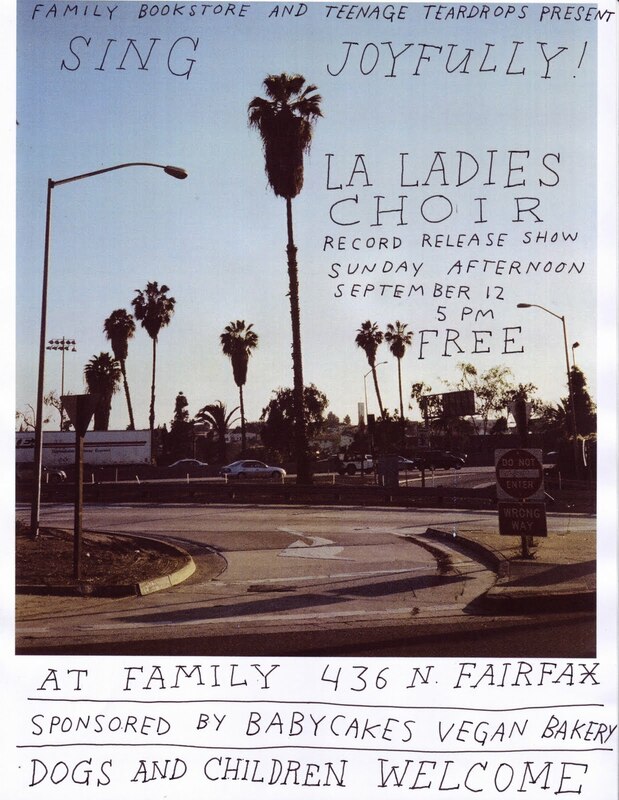 The L.A. Ladies Choir, is a 30+ piece band of women and children who perform choral arrangements of songs by Leonard Cohen, Yoko Ono, and Marvin Gaye, as well as originals composed by various choir members. These members include songwriters Becky Stark (Lavender Diamond, The Decemberists), Aska Matsumiya (The Sads, Moonrats), Diva Dompe (Blackblack, Pocahaunted), and Anna Oxygen, as well as creatives like pastry chef Jenny Park and Secret Shop vintage-store owner Kitty Jensen, and many many others! "We wanted to create this positive feminine energy, not against anything, but just this beautiful energy of strength and power for something, by women," Aska Matsumiya says. Becky Stark articulates The LA Ladies Choir philosophy as follows: "We are a collective of women devoted to singing together joyfully! When we sing we experience the pleasure of our voices. And when we are together we organize our experience according to the principle of being kind above all things. Our music is the sound of this! We recognize that music is a resource for strength and we have the ability to magnify our strength by coming together and sharing our joy!" Sing Joyfully is released by LA vinyl/casette label Teenage Teardrops, and produced by the legendary Jim Scott. Proudly sponsored by Babycakes, serving delicious vegan, gluton-free baked goods!